I can recite the entire words to both the Toy Story films, that is the level of Toddler love that they generate. I have to admit, I had never even seen them before having children, but I wish I had. They are fantastic films which adults and children can relate to and I really can’t wait to see Toy Story 3. Toy Story is the tale of a little boy who gets Buzz Lighter for his birthday. Buzz usurps his previous favourite toy, ‘Woody’ the cowboy doll. Both toys get lost and have a serious of adventures which reinforce all sorts of ideas of what it means to be friends. It’s a lovely heartwarming story. 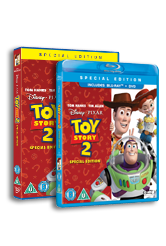 Toy Story 2 continues the theme of friendship when ‘Woody’ gets stolen and the toys have to rescue him. Its full of Star Wars parodies which will keep any film buff amused. We were lucky enough to be given both films on Blu-Ray. 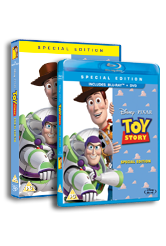 With the exception of ‘UP’ they have to be the best films we have seen yet on Blu-Ray. The colours of the film really come alive. What’s more, there is a sneak peak of the characters for Toy Story 3 just to get you in the mood. Both movies have loads of extras on the Blu-ray, most of which I have enjoyed watching as much as the Toddler. 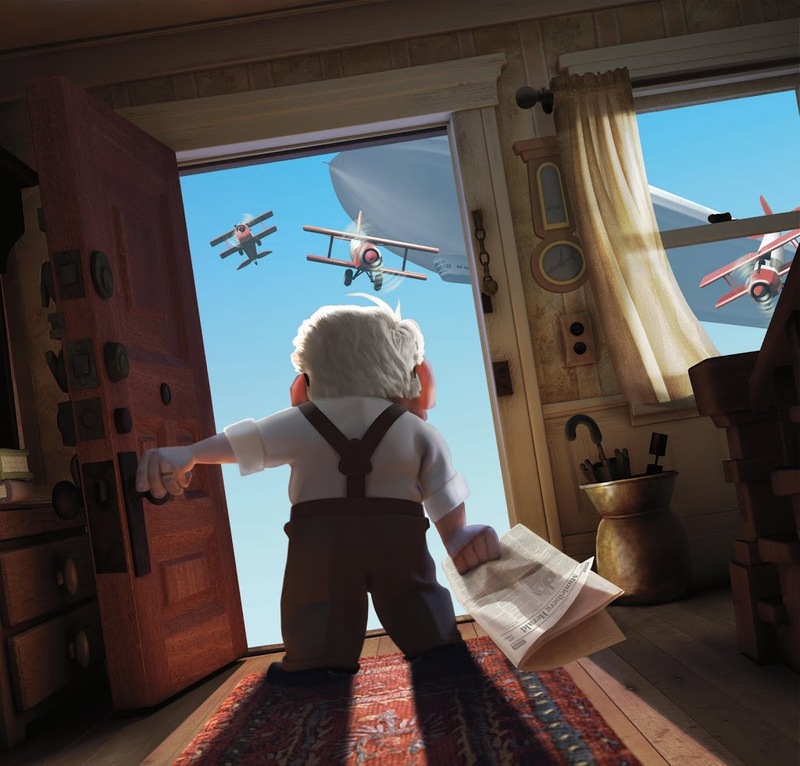 This month Disney released the Blu-ray/ DVD of ‘UP’. They gave us a copy. I cried. This has to be the best Disney film I have seen in a while, its suitable for both adults and kids, looks fabulous and has a really touching story. If you can get the Blu- ray version, it’s one of those films that just looks incredibly vibrant, sharp and visually you will benefit. The opening sequence, which deals with Carl finding his sweetheart, their dreams, hopes and aspirations, growing old together and the heartbreak of her passing away, was the bit that made me cry, and I never cry at films. This is heavy going for the opening of a kids film, but I’ve always thought that Pixar films are just animated films that happen to appeal to kids as well as adults. Once you’ve wiped the tears away, the film rejoins Carl as an old cantankerous widower who is refusing to move house, despite being in the middle of a building site. Through various happenings, Carl finds himself flying his house via balloon to South America with a chubby little wilderness scout called Russell. Russell the wilderness scout is that annoying little squirt that everyone knew at school- watching his relationship with Carl develop is great, by the end their is a grudging level of affection and respect between the two of them. Talking dogs, a mad explorer, a big daft bird, and some absolutely brilliant jokes make this a top film. I honestly can’t remember the last time I enjoyed a film this much, even on the fourth, fifth or sixth viewing it’s still enjoyable to watch. Just as well, as I expect this might join the ranks of Tinkerbell, Toy Story and Bee Movie as one of our favourite essential movies of all time (this year at least!). “Boggis and Bunce and Bean, one short, one fat one lean…” If these are words that resonate from your childhood, then you’ll probably be aware that Fantastic Mr Fox was recently turned into a film. It has one of the most stellar vocal casts I’ve ever seen- George Clooney, Meryl Streep, Michael Gambon and a sly cameo from Jarvis Cocker as Petey, are the highlights but nobody really puts a foot wrong. Unlike a lot of the computer animated affairs, the characters aren’t homages to the voice talent either (Will Smith in any animation is definitely Will Smith). In fact, the animation is in a league of its own. It doesn’t try to compete with Pixar because lets be frank, everyone that tries to do that fails miserably but the animation is so charming, you can’t help but love it. But I’m getting a bit ahead of myself here, lets rewind a couple of weeks to a very generous invite to a private screening of Fantastic Mr Fox at 20th Century Fox’s offices in London prior to today’s DVD release (1st March). We also got a pre release copy of the DVD too. Which was nice. So obviously I’d seen the film about 5 times by yesterday morning. M’laddo hadn’t been to the cinema before and I must admit I was a little apprehensive that he would have the ability to concentrate and keep still for the duration of a film at the cinema. It’s a bit different at home, he can wander around, grab a cheese sandwich, push his little sister over and so on and so forth. After all, he isn’t quite 3 yet. I shouldn’t have worried though because as soon as the 20th Century Fox logo and anthem appeared (something my generation can’t really separate from Star Wars), an absolutely smashing grin appeared on his chops that didn’t disappear for approximately 83 minutes. He really was transfixed. There are so many neat touches, the banter between Mr Fox’s son Ash and his cousin Kristophersson are brilliant, really capturing the tension between youngsters. The use of the word “cuss” instead of swearing is inspired and has entered my daily lexicon to boot. As well as a great vocal cast, the film has a truly cracking soundtrack. The characters wander around with little music players clipped to their belts, a nice touch, to provide us all with some musical accompaniment. We get Beach Boys, Rolling Stones and a new composition from Jarvis Cocker. All in all its remarkably loyal to the book whilst being its own film and having its own style. I simply love the animation and hope they do another film using the same style. For M’laddo its joined “New BuzzLightyear” and “Flappy Bat” as one of his most favouritist films ever. Lucky old us, we are on the Think Parents panel and this means that we get sent lots of Disney DVDs. This month, we got Snow White and the Seven Dwarfs. The classic film has been re-released on Blue-Ray and DVD. Snow White is a remarkable film, it is one of those classic bits of animation that has lasted for decades and looks as good today as was made in 1937. Or, so I imagine. To put this date into context it was made before Hitler annexed Poland. Before Gone With the Wind was made and even before Neighbours became a popular television programme. It was actually the first film I ever went to see at the cinema when it was re-released in 1982. I can remember the excitement clearly, even now. I wanted to be Snow White for years after that. This is a great chance to get a really tip top version of the film, we loved every second of it. Partly, I think, because I actually sat and watched it with Toddler boy, discussing different parts of it and how I felt when I was little and saw it for the first time. There are not many films that enable you to do that. If the kids haven’t seen Snow White make sure they do, as its one of those unmissable classics.